I grew up quite active, playing outside and enjoying any activities that involved a ball. My interests lead me to competitive soccer, playing in both club and school teams. In 2012, I began training as a CrossFit athlete; which enventually lead me to competitive training. In 2013, I began serious training which culminated in competing in a team (Squat Mafia – CrossFit Terminus) in the ultimate stage, the CrossFit Games (2015). 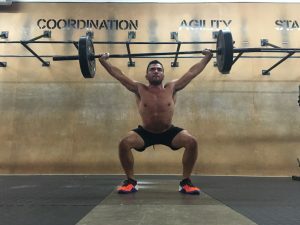 I became a CrossFit Coach, because I fell in love with the sport. Everything that surrounds the sport of CrossFit: nutrition, health, strength, body awareness, friendships, camaraderie, etc. is what makes it so special. After a few years of working and learning from some great coaches and fellow athletes, as well as taking time to educate myself, I decided that I wanted to share what I had learned and help other athletes achieve their goals. At CrossFit MIA, I take great joy watching our member’s grit and determination. It motivates me to not only help them become the athletes they aspire to be, but become a better athlete myself. I’m always amazed at what they can achieve when they remain persistent, and make sacrifices to attain their end goal.